"Day Tripper" Mini Cylinder Valve Charging Kit for M18 x 1.5mm Cylinder, complete with 100mm Hose. "Day Tripper" Mini Cylinder Valve Charging Kit for M18 x 1.5mm Cylinder, complete with Mini Gauge and 100mm Hose. 1/2" UNF male/male 16mm Diameter Body Screw in Silencer Adaptor/Convertor. Universal...Black Anodised Aluminium. Complete with Thread Protector End Cap. 1/2" UNF male/male 16mm Diameter Body Screw in Silencer Adaptor/Convertor. Universal...Polished Brass. Complete with Thread Protector End Cap. 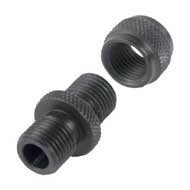 1/2" UNF male/male 18mm Diameter Body Screw in Silencer Adaptor/Convertor. Suits Air Arms S510/S410 Extra FAC...Black Anodised Aluminium. Complete with Thread Protector End Cap. 1/2" UNF male/male 18mm Diameter Body Screw in Silencer Adaptor/Convertor. Suits Air Arms S510/S410 Extra FAC...Polished Brass. Complete with Thread Protector End Cap. 1/2" UNF x 30mm Gender Changer. For 1/2"UNF Male silencer to fit 1/2"UNF Screwcut Barrel...Black Anodised Aluminium.